There's some adorable monkey business happening over at Ellen Hutson LLC today, it's bananas! Sorry I can't resist the monkey puns! 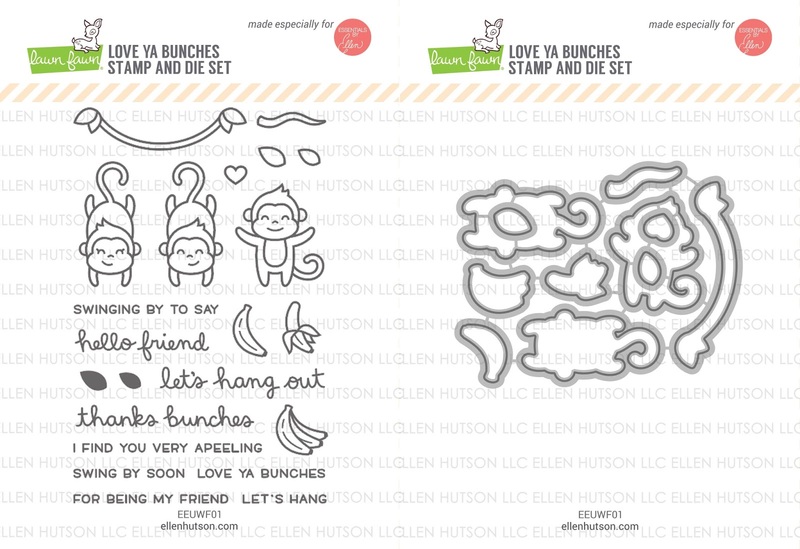 It's a super cute Lawn Fawn set designed exclusively for Ellen Hutson as part of the EH United We Flourish campaign. After stamping subtle gray bananas on a white panel, I die cut the Hinged Thanks. Behind the thanks, I created a shaker window with acetate and foam tape. I filled the shaker window with little colored banana die cuts & yellow sequins. On the front, I let my little monkey hang from the n window. Hope you are having a great weekend and stop by again on Friday to see more of my monkey cards! united we flourish - love ya bunches!